Many more interviews with industry experts, industry law makers, scientists and any random bod that wanders past EWB towers. Many suprises to come in the next few months. Since it is ridiculously windy outside (hurricane bawbag 2) I thought I would crack open a few rums. I love rum. So many different countries make so many different styles. 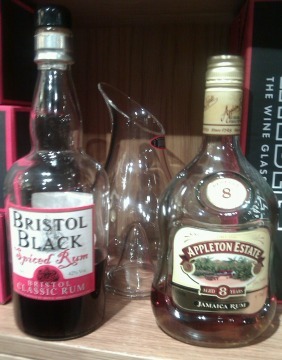 Whether you like lighter fruity Rum Agricole or darker Molasses based rum. Golden Rum, Dark Rum, Blanco or Rum liqueurs. There are all sorts of Rums for every palate. 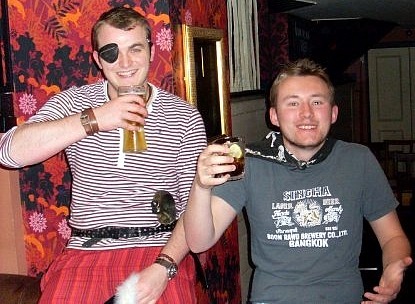 And the other great thing is; you feel like a pirate when you drink rum. The 2 rums I have chosen to try are both molasses based, but one is a golden rum (cask influenced flavours) and the other is a dark spiced rum (cask influenced, lots of caramel added and spices added too). Nose: Nutty, chocolate and honey. It’s a bit creamy, and there are hints of almonds. Lovely stuff, if perhaps lacking the huge punch some golden rums have. Palate: Bit more spice on the palate. Honey, cream and cocoa. Overall: I could drink this all day. Very easy drinking and sweet. Overall: Amazing nose, but a bit much on the palate. One for a cold Christmas night with a mince pie, but I would only have the one. This entry was posted	on Tuesday, January 3rd, 2012 at 11:40 am	and is filed under Miscellaneous. You can follow any responses to this entry through the RSS 2.0 feed. Responses are currently closed, but you can trackback from your own site.